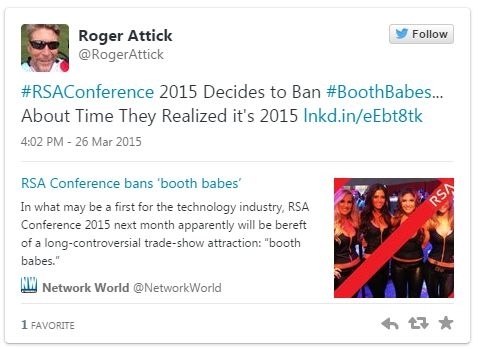 Booth babes are to trade shows like engine noise is to NASCAR – it seems you can’t have one without the other. Until now. The RSA security conference in San Francisco is warning exhibitors at its upcoming San Francisco event that exhibitionism won’t be tolerated. We’re talking about San Francisco, no less, the city once known for men in chaps (and little else). 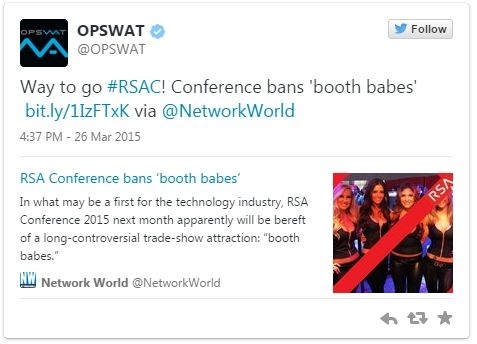 Bill Brenner at LiquidMatrix reports that “tops displaying excessive cleavage, tank tops, miniskirts, shorts, and any objectionable or offensive costumes” will not be tolerated at RSA 2015. And before you get your back up about discrimination, rest assured: RSA says the guidelines apply to all staff “regardless of gender.” So men can’t wear halter-tops or short skirts either, in case you were wondering. Male attendees outnumber women by at least three to one at typical tech conferences, and using scantily clad women to lure men into booths is an old tactic. But in an industry that’s faced heavy criticism for its unbalanced treatment of women of late, the times are finally changing. 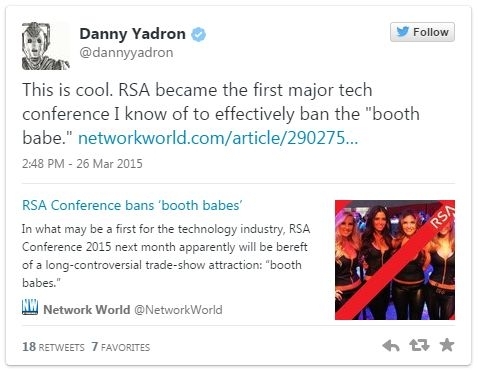 RSA’s move follows a similar ban at the much smaller gaming gathering PAX, but RSA is the highest-profile tech expo to just say no to Lycra bodysuits, plunging necklines and the like. So far, the conference has yet to receive any complaints regarding the new policy, she said.